The eleven pieces in the exhibition “Quercus with Companions: Recent Work by Ana England resulted from more than a yearlong study of how the oak tree (Quercus) is a nucleus for the overlapping life cycles of hundreds of forest inhabitants. Seven of the works are composed of half spheres carved with textures of the oak. 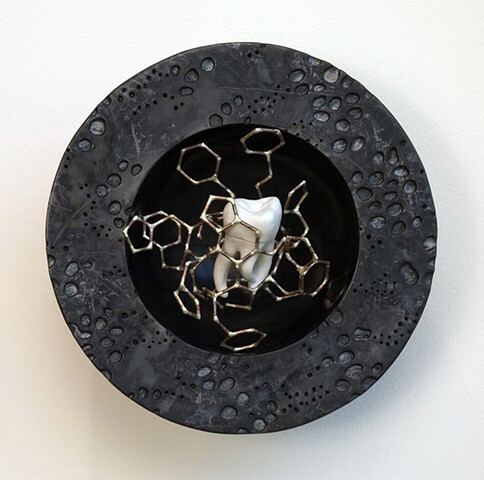 A carved porcelain form of an associated species is affixed to the semi-sphere by a bronze molecular structure. For example, the vein patterns of oak leaves surround the form in “Quercus with Triad Shield Bug”. The oak’s vascular system surrounds a human tooth in “Quercus with Tooth”. In “Quercus with Lichen”, the lichen is surrounded by carved oak bark. 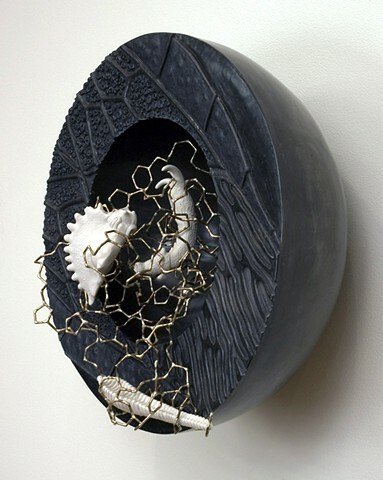 In “Soil Song”, bits and pieces of acorn and other seeds, twigs, fungus and bark were scaled larger and carved in porcelain. 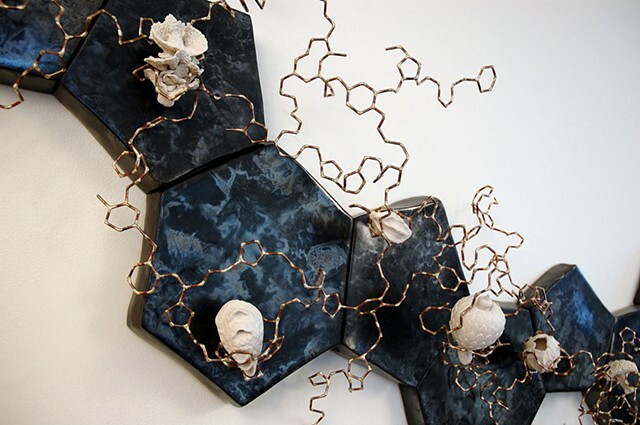 A bronze molecular structure holds them to each other and the ceramic hexagonal and pentagonal forms that were fired in oak leaves. 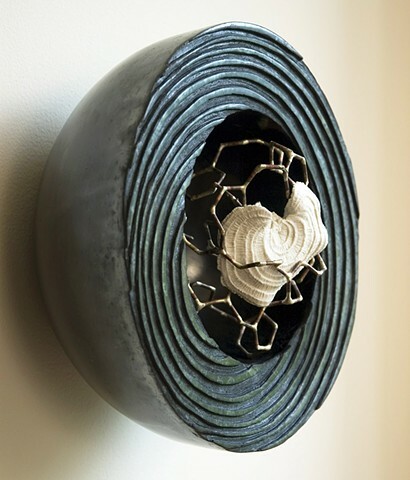 “Terrain” locates the oak within the larger environment with carved patterns such as the magnetic field of the earth, the spiraling movement of a tornado and a topological map of my property. 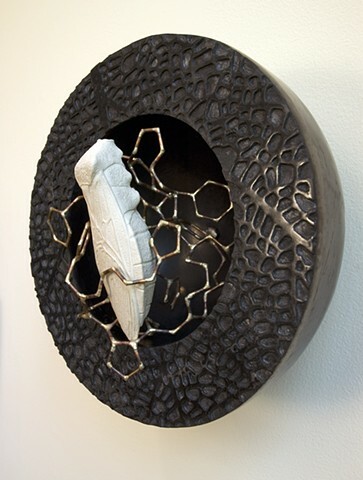 A complex bronze molecular structure sweeps around the ceramic forms, integrating the environmental elements. 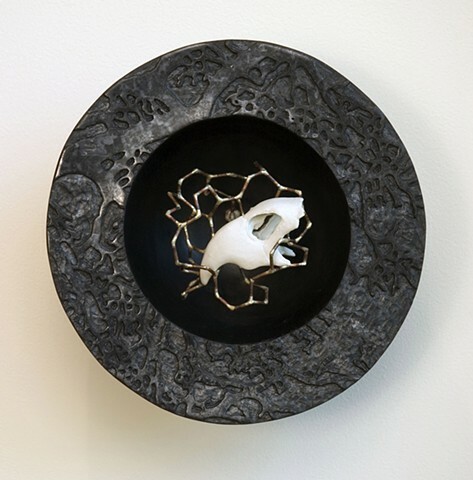 The ceramic elements are burnished stoneware clay, bisque fired to cone 010, fired unglazed in a raku kiln with post fire reduction in oak leaves over sawdust. The porcelain forms are fired to cone 8 in an electric kiln. 10.5" x 10.5" x 7"
10.5" x 10.5" x 6.5"